Who doesnt want a beautiful white smile? There are many products and techniques available for patients who want to achieve a brighter smile, and with so many options available, it can be difficult to choose the method that is right for you. The best way to begin any teeth-whitening regimen is to schedule an appointment and talk to Dr Rich about the differences between in-office professional whitening and at-home whitening. At Dr. Rich's office we offer the ZOOM IN-OFFICE tooth whitening procedure which involves the use of a special light-activated solution to accelerate the whitening process. 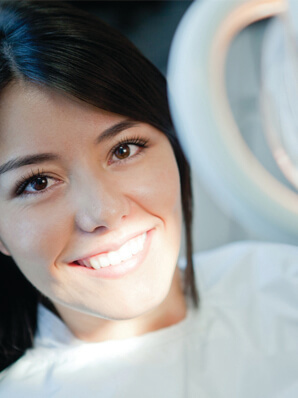 With our in-office whitening treatment, we can whiten teeth dramatically in one appointment. The process takes 2 hours and you walk out with a whiter smile. For best results, we recommend combining a home tooth whitening treatment as a companion to the in-office procedure. At-home professional teeth whitening uses custom-made trays and special whitening gel that can only be prescribed by a licensed dentist. The whitening gel is placed in custom-fitted trays that fit perfectly over your teeth. Our office offers several different solutions so that Dr. Rich and our patients can decide what the most effective solution will be for your situation. At-home professional tray whitening generally takes ten to 14 days, although you may notice results in as little as three to five days. There are many over-the-counter teeth whitening options, including Paint-on whiteners, Whitening Strips, and Whitening toothpastes, which are less expensive and less effective than professional options. Paint-on teeth whiteners consist of a gel that is applied to the tooth using a small brush. Paint-on whitening gel hardens into a film that coats the teeth, and dissolves in the mouth. Teeth-whitening strips are thin, flexible plastic (polyethylene) strips with a thin film of hydrogen peroxide on one side. The whitening agent is applied by placing the strips across your teeth and gently pressing the strips to ensure contact with all your teeth. The least expensive options are whitening toothpastes and mouthwashes. Designed to have “whitening” capabilities, toothpastes and mouthwashes work to remove surface stains using mild abrasives. However, these products do not lighten the actual color shade of the tooth. Whitening toothpastes affect surface stains and may mildly lighten your teeth.